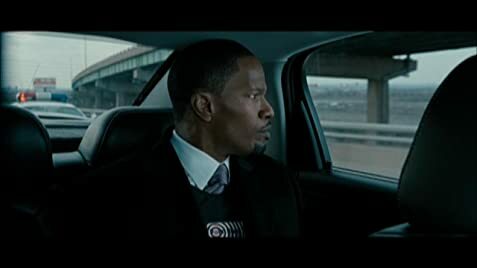 Detective Dunnigan: [to Nick over the phone] that contraption used to kill them was a weaponized bomb disposal robot, it had video, night vision it fired military API's, that's anti-tank rounds. I think his saving you for last, you've got to get in front of this guy if you want to stay alive. 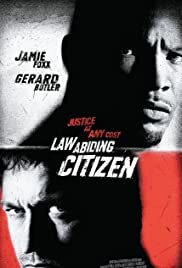 Q: Is "Law Abiding Citizen" based on a book? Q: So, who is the villain: Shelton or Rice? I am just not sure which is which. I am trying to avoid spoilers here, because it is a definite film you must check out because it is a great new take on the prison based thriller genre, which provides 90 odd minutes of great entertainment with lots of twists and turns to keep the story fresh. My main criticism is that the story seems to twist and turn so much it gets itself into a nasty tangle. The base of any thriller for an audience, is to want the protagonist to prosper at the downfall of the antagonist, but at the end, i was unsure which of one of the two mains, Nick Rice (foxx) or Clyde Shelton (butler) i should be 'cheering' for. Each Character has their fair amount of being the good guy, but both were more of the bad guy, a very confusing aspect to a thriller. Never-the-less, there are some brilliant performances and a very entertaining fresh story kept me glued to the screen for the entirety of the movie.